Tracing the history of comics as an industry is no simple task. Reflecting our modern society, comics have spanned continents and, as an art form, can be found in a multitude of cultures. 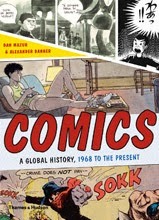 Comics A Global History, 1968 to the Present attempts to provide a cohesive exposition of comics in Europe, America, and Japan for the last 50 years. This is a great tool for the budding historian in anyone interested in the wider influence of comics. While not isolated to the geographies mentioned above, there are some places, such as Argentina, South Korea, and New Zealand, that also get a mention in the book. This recent release undertakes a mammoth task, which in itself, is suitable pulled off. The authors, Dan Mazur and Alexander Danner, have provided an insightful narrative that is broken down into appropriate periods for the reader. Both Danner and Mazur are heavily involved with comics. Whether teaching writing, editing, or drawing, it is clear that a wealth of knowledge and passion has been used to bring this book together. Comics A Global History has opened me up to a renewed interest to the independent side of this industry. It balances the commercial activities that have spurred growth since the 1980's and 90's with the underground movements and artistic expressions we can now find along side commercial megaliths in your friendly local comic book store. surrounded by a variety of supporting images. The publishers website summary of Comics, A Global History states that "the story begins in 1968, a key year in comics’ shift from being driven by commercial potential into a means of self-expression respected not just as entertainment, but also as art. The book traces comics’ evolution up to the emergence of today's global, digital scene and the medium’s likely future". I can confirm this broad reach of the book is well covered. 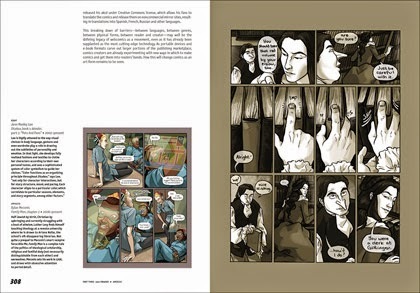 Not only this though, Comics, A Global History traces the industry trends, styles, and movements as the influence of important creators flows and ebbs in local geographies and can be seen as interconnected to the foreign comic industries. Forget what you thought you knew and start again with this fascinating reading of comics history. Read as the pieces of this truly international industry comes together in front of you in fascinating detail. Covering such scope over a 50 year period meant that at 320 pages and accompanied by 287 beautifully rendered illustrations, this book doesn't make for light bed time reading. You need to pace yourself, but you will be rewarded by making it to the end. It is a worthwhile pursuit for those of all backgrounds in comics, whether novice, newbie, or stalwart expert. Check it out. Let me know below what you thought about Comics A Global History and if you have any good recommendations for other comic industry insights.